Many of the user has many accounts for their uses but remembering the password of all platform is very difficult. Many of the user insert same password for their all sites which is not secure because if a person know your one password than all of your site is no longer secure it may be possible that they can broke down your security and read your all data. Many of the user not change their password they still use same password for a long time which is not secure you have to change your password at least in a month but it is very difficult to change and remember that all. So the best way to manage all these password is to use Best password manager which is secure and simple to use. So lastpass is a tool which manage your all site password and also very easy to use.The cool thing about this password manager is that it is available on both mobile and PC platform. When you login to any account on any site than you don't require to fill all the detail you have to just click on the login option on the site than it auto ask to fill the detail that you fill in the lastpass. Different platform has different info it auto detect and provide you the require detail you want to fill in any site. You have to just fill the information in lastpass and save it than when you login to site it automatically fill your details in the require place. 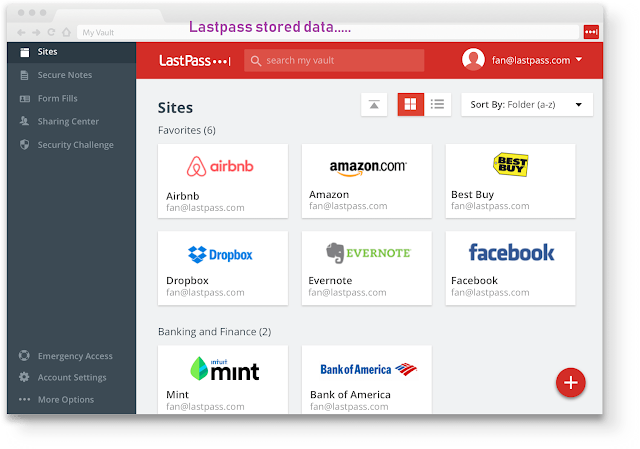 I personally recommend you guys that lastpass is the best password manager tool which makes your work very easy and you don't have to worry about your password.